Why do I need fertilizer? When? What kind? How do Master Gardeners fertilize plants? The answer to this question is easy to answer: It all depends on the plant. Now that you have been left even further mystified about fertilizers, learning some basic principles about plant nutrition can help you make a decision like a pro. Plants require nutrients in varying quantities for proper growth, flowering, fruiting, disease resistance, winter hardiness and root development that are derived from the soil. Some nutrients are required in large amounts: Nitrogen, Phosphorus and Potassium and are represented by the three bold numbers on a fertilizer package. Fertilizer may also contain micronutrients like sulfur, calciumand iron needed in smaller amounts. Nutrients are available to the plant according to the pH (acidity or alkalinity) of the soil. This is the logic behind getting a soil test: to determine pH and nutrient availability. In other words, you can apply a fertilizer to a plant but if the soil pH is incorrect it will not be available and a waste of time and resources. Howevermost plants grown in Illinois can benefit from the addition ofa fertilizerswith the nutrients: Nitrogen, Phosphorusand Potassium because they are required in large amounts. A general rule of thumb for Master Gardeners is to fertilize newly planted annuals, perennialsandvegetables with a liquid fertilizer treatment about two weeks after planting to give it a boost. Annuals will then need to be fertilized with a liquid feed every 2-3 weeks or with a controlled release fertilizer that is dry and encapsulated where nutrients are released slowly over a period. Regular fertilizing of annuals keeps up with the production of flowers. If your annuals have dried down or become too leggy, give them a hair cut and a liquid feed and they will come back more beautiful than ever. Each vegetable you grow may have different nutrition needs and then should be fertilized accordingly. Because tomatoes are heavy feeders, University of Illinois suggests a fertilizer treatment at or around time of transplant, again when tomatoes are small with 1 tbsp. of 10-10-10 or ammonia nitrate fertilizer and again two more time at three and six weeks after the second treatment. However, beets and carrots may not require additional fertilizer treatments. Trees in Illinois seldom need fertilizers unless nutrient deficiencies are evident (wrong color or poor growth). 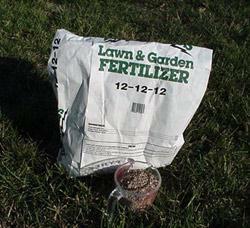 Lawns are generally fertilized in spring and fall and when first seeded. It is important to know that lawns must not be fertilized with phosphorus unless newly planted, a soil test determines a need or you are a professional. Most landscape perennials and shrubs do not need but one fertilizer treatment a year with a liquid feed or a controlled release fertilizer just before new growth appears in the spring. Always follow directions on the back of the fertilizer package. Inorganic fertilizers benefit the plant because they are readily available and quick but do little for the texture of the soil. Organic fertilizers release slower improves the soil structure but can be more expensive. Some organic fertilizers that can be considered are composted manure, fishmeal and emulsion, kelp meal and earthworm castings. Organic fertilizers generally have single digit bold numbers like 7-4-2 rather than the 20-20-20 of a synthetic in organic fertilizer fertilizer.